It’s SIMPLE. 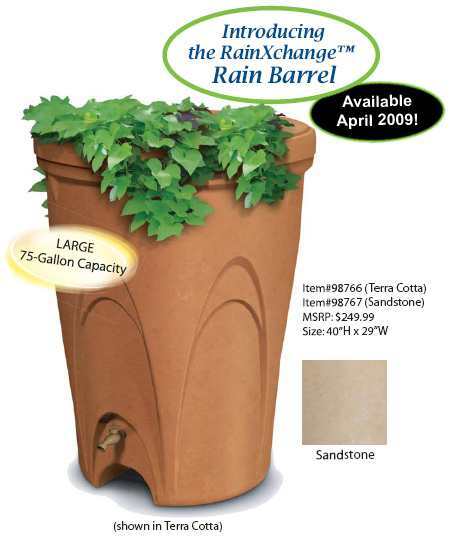 The Aquascape RainXchange™ Rain Barrel can be incorporated into any existing gutter and drainage systems, Up to (2) Rain Barrels can be shipped Fed-EX. Discounts on 10 or more! With more municipalities enforcing watering restrictions upon homeowners, rain barrels are gaining popularity at a rapid rate. Gone are the days of consumers having to rig their own barrel to capture the rain. While makeshift barrels are still an option, decorative rain barrels are springing up in garden centers everywhere. 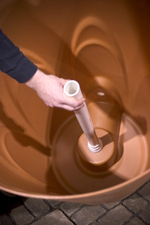 ShopTJB.com is proud to offer Aquascape’s new RainXchange™ Rain Barrel. The RainXchange™ Rain Barrel offers an introductory option for consumers looking to get started with rainwater harvesting. Durable, plastic walls withstand extreme weather conditions and a 5-year warranty is included. A brass spigot can accept a garden hose for ease in irrigation. 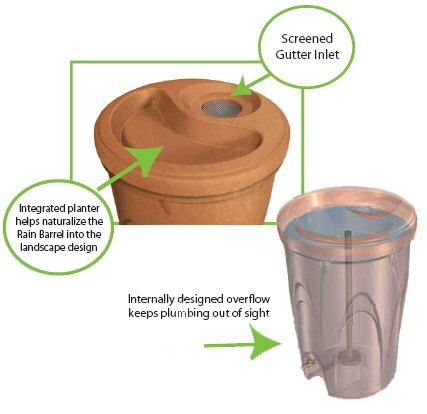 The childproof lockable lid has a screened gutter inlet and can be used as a planter to help naturalize the barrel into the landscape. The attractive design is an aesthetic option for stormwater management over traditional rain barrels that tend to be an eyesore in the landscape. The majority of rain barrels capture about 50 gallons of rain, but Aquascape’s new RainXchange™ Rain Barrel holds 75 gallons of harvested rain before filling up. And in the event the barrel fills completely, a handy, internal overflow system has been incorporated to direct water away from the house during heavy rainfalls. 1-2 units will ship individually by Fed-Ex for $75.00 each anywhere in the continential USA. Discount on 10 or more Rain Barrels + Reduced Shipping! If shipping to a commercial location, please call us @ 203-287-0636 for reduced shipping rates for 3 or more units. See It In Action "Click Here"
A rain barrel is any above ground container modified to receive, store, and distribute rooftop runoff for non-drinking uses. The typical size of a rain barrel is 55 - 75 gallons. 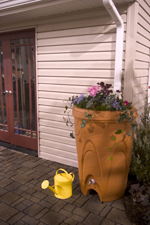 The main components of a rain barrel are a connection to the downspout, a filter to prevent mosquitoes from entering, a faucet to allow for regulated usage, and an overflow pipe to divert the excess water. Saves water for dry spells. Reduces runoff and stormwater pollution. Can reduce your water bill, especially in the summer. The rainwater collected can be used to water lawns and gardens or wash cars and bicycles. Rainwater collected within the barrel is safe for plants because the typical minerals and pollutants trapped in the rainwater are filtered out by plant roots. Rainwater collected in the rain barrel is not for drinking; rainwater is more acidic than tap water and may contain particulate matter from air pollution. Costs can be reduced if the barrel is installed by the homeowner. In the summer, lawn and garden watering account for 40% of average household water usage. By adding a rain barrel, the need for municipal water is reduced. According to the US Environmental Protection Agency, a rain barrel can potentially save most homeowners about 1,300 gallons of water during the peak summer months. Since only a ½ inch rainfall on a 160 square foot roof will fill a 55 gallon rain barrel, some people choose to get a tandem barrel (2 barrels at 1 downspout) or another barrel at a different downspout. The barrel will require periodic cleaning. A safe cleaning solution is 2 teaspoons of castile soap and 2 teaspoons of vinegar per gallon of water or 2 teaspoons of lemon juice per gallon of water. In the winter, the barrel will need to be emptied and disconnected from the downspout. From Anonymous of Westminster, California on 4/6/2015 . 4/27/2011 – Do you have a catalog, locvation of store and can one purchase the fixings from you? 4/27/2009 – IS THIS MADE IN CHINA OR USA?